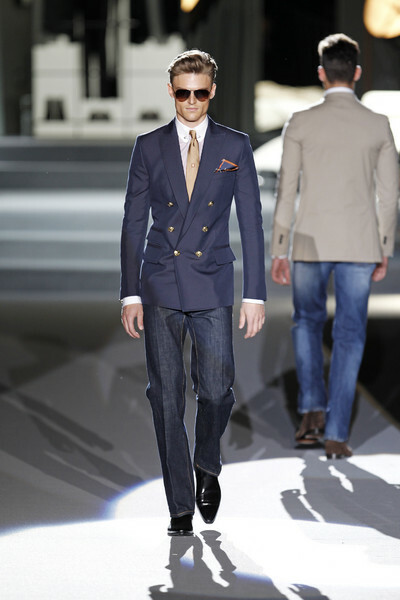 This time twin-brothers Dean and Dan Caten took the movie American Gigolo as their inspiration for the spring summer 2011 collection. It’s an ambitious choice, since the suits Richard Gere wore in the move were designed by Giorgio Armani. But the collection wasn’t about the look of Gere, it was about the luxurious lifestyle these guys lead and their attitude. So the model looked tanned, handsome, in great shape and were dressed in tight trousers and unbuttoned shirts. The once ultra ultra low DSquared-jeans appeared with high waist and a flare – so that means you will have to get rid of that belly, boys. Jeans were mixed with (shiny) shirts, blue was the main color besides bright colors like red and green. The overall look was rather dressed with a casual feel like we’ve seen before this week in Milan.